To epoxy the planking to my Malahini, I used drywall screws and some squares of scrap plywood to clamp the mahogany. 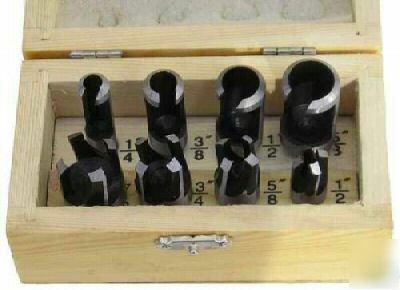 I planned to countersink and plug the holes. Unfortunately, a few of drywall screws had their heads snap off when I tried to remove them. The shaft is about an 1/8" below the surface. Since this is the deck planking and I was going to countersink and plug the hole, the embedded shaft of the screw is in the way. I also can't go off-center since the plugs would no longer line up. Any ideas on removing or grinding off some of the embedded screw shaft so I can plug it? Bob - There are a number of broken screw extractors available. Find one that fits your need and does not create a hole larger than your plug. I had several broken stainless screws that was a pain to remove. The extractor that gripped the broken tip with sharp teeth worked for me. I did not replace the screw but simply clean drilled the remaining hole and plugged it. Regarding the broken screws. My first thought was the epoxy has a hold on them. You might to apply some heat to the future ones with a soldering iron to be sure the epoxy softens and let's go. I hadn't even thought of that. Great idea. The drywall screws shafts are thin and seem harder than normal screws. The normal type screw extractor does not work. Heating it would have been a good idea, although only 6 out of about 200 broke. I'd hate to heat each one before removal. And, now that its broken I can't get a hold of it. I do like the idea of drilling around it. I used a Dremel to cut a little channel around the screw and then removed the drill from a countersink and just chucked the counter sink. I was able to drill around it, but not deep enough to get it out. I also have those plug cutters (at least cheapo HF ones). The smallest one (1/4" plug) has a diameter that is greater than the 3/8 plugs I want to use. Although, I'm thinking of chucking it in a drill and grinding it down to just under 3/8" while it rotates. If I could just grind the screw shaft down, I could fit a plug. I'm going to check Dremel for a grindstone that might work. When I did my planks I just used the dryway screws for fitting. Once that was done I countersunk and bored the holes for the bronze screws and plugs on my drill press. That way I did not have to worry about removing the screws from the epoxy. The bores were all drilled in and once the boards were in place, I just popped in the plugs. I like the idea of using the plug hole cutter around the broken screw. You might then be able to grab the screw shaft with a pliers and then twist it out or break it off low enough for the plug. If you heat it first after cutting acess, you might be able to back it out like Roberta said. Roberta: That makes so much sense. I don't know why I didn't do that. For most of the build I used these drywall screws as a temporary clamps and then went back and replaced at my leisure. I actually did break a few, but they didn't matter. On the deck planking, they do. Anyway, I was able to get all 6 out. On the first attempt I messed up the hole a bit and will probably need a larger bung. Here is what I was faced with. I got to this point by using a small routing bit in my Dremel to create a small hole around the screw. I need this to guide the counter sink bit. I used the bit from a drill set but removed the drill. I had to chuck this into a 1/2" chuck that I put on my cordless drill. This let me drill the countersink around the broken screw. I then used the routing bit to chew out more wood around the shaft. Then I used a small tapered grinding bit to flatten one side of the screw. I think this also heated the shaft and help free it. I used a needle nosed pliers to get a grip. It was still a struggle to get it started, but usually once I got it moving I could get it out. The countersink bit just fits in a 1/2" chuck. The routing bit is 1/16" in diameter so once the countersink is drilled it fits in the hole without enlarging it. I had to be careful with the grinding stone as it was a tight fit and I didn't want to enlarge the hole. Good Job, Bob!!! Many classic boats have a few varying size bungs. They will add realism and character. You can also get a small piece of thin wall metal tube a little larger ID than the screw OD and grind or file teeth on the end of it. If you use a high carbon steel of some sort you can heat and quench it to harden it a little. Chuck it in your drill and drill slowly down around the screw until it is free. It will leave you with a much smaller hole to deal with as you choose. This is why I gave up on using drywall screws anywhere in the build pretty early on. Just too brittle and snapped too easy. I switched to wood screws (thicker shank, like the bronze screws) for temp fasteners, and they worked much, much better. Anyway, glad you got the buggers out! I missed two screws, so I went after them a few days later. My method described above did not work. I think the epoxy had time to really set up and I couldn't remove the screws. However, I did find a different Dremel bit that had a small ball tip covered in tungsten carbide. This bit let me grind the shaft of the screw down in the hole. I could then twist off the shaft deep enough to permit the bung to fit. Do NOT use drywall screws for holding pieces you have epoxied! !